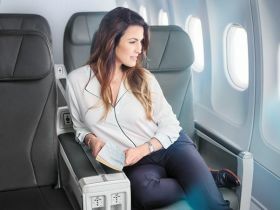 Customers can start their vacation early by upgrading to Club Class. On board our dedicated cabin provides extra comfort with larger seats and extra legroom. Passengers will enjoy a personalised service with a welcome drink and our gourmet menu from Quebec’s renowned chef Daniel Vézina.